I interpret this to mean that the Customer Phone number (land line) field should remain optional, but if entered, it should check if the local area code had been entered, and if not, default it according to the local store’s area code. We can assume that the area code has already been entered if the phone number starts with a zero (0). They only want to default the area code for landlines, so if the store’s phone number happens to be a mobile phone number it should not do any defaulting. Step 1: create a database function (in a database package, natch) to return the landline area code for any given store ID. Value: $v("P1_CUSTOMER_PHONE_NUMBER").length > 0 && $v("P1_CUSTOMER_PHONE_NUMBER").charAt(0) != "0"
Now, when the user types in a local land line but forget the prefix, the system will automatically add it in as soon as they tab out of the field. If the phone number field is unchanged, or is left blank, this will do nothing. It assumes that the customer’s phone number uses the same prefix as the store, which in most cases will be true. Ultimately the user will still need to check that the phone number is correct for the customer. Here is a short story about a little problem that caused me a bit of grief; but in the end had a simple cause and a simple fix. I had a dynamic action in my APEX 4.1 app that had to run some PL/SQL – which was working fine, except the PL/SQL kept on getting longer and longer and more complex; so quite naturally I wanted it to be encapsulated in a database procedure. I did so, but it didn’t work: the page ran without error, but it seemed like the dynamic action wasn’t firing. It was supposed to change the value of some display items on the page in response to the change of a radio button item, but now they weren’t changing! There was no debug warnings or logs to give a hint either. I tried using Chrome’s developer tools to trace it but that just showed me a very high-level view of what the client was doing, and didn’t report any errors or warnings. 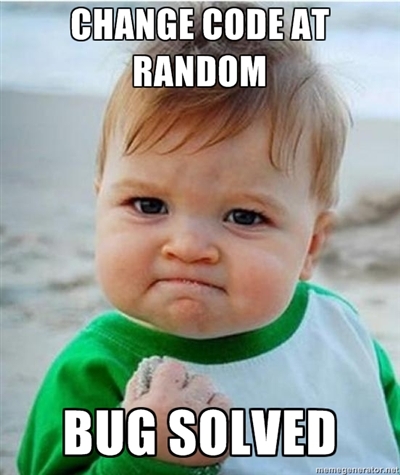 I reverted to my original code, and it worked fine. Ok, so that means it’s probably a problem with my procedure. I checked and rechecked my procedure. Didn’t seem to be anything wrong with it. I added a line into the procedure to raise an exception. The APEX page dutifully reported the PL/SQL error in the Ajax call – which means that my procedure was being called successfully. Also, I included the return values in the exception message, and this proved that my procedure was correctly determining the values. They just weren’t being returned to the items on the page. I tried raising an exception in the apex dynamic action’s PL/SQL Code. That worked. The exception message correctly showed the new values were being returned; they still weren’t being populated on the page. I tried removing all the items from the Page Items to Return setting; then I gradually added them back in, one by one. I narrowed it down to just one item. If I included that item, none of the items were being updated when the procedure returned. If I excluded that item, all the other items were correctly being updated when the procedure returned. Of course, that wasn’t a solution, because there was a cascade of other dynamic actions that were dependent on that particular item, so it has to be updated. After lunch and a short walk, it occurred to me: unlike the other parameters, that particular parameter was anchored to a database column defined as CHAR(1). Could that be a problem? Sure enough, when I changed the parameter’s data type from column%TYPE (which mapped to a CHAR) to just a plain VARCHAR2, everything worked. Yet another reason to avoid CHAR, I guess. I want to visually enable/disable certain items in each row of a tabular form depending on the value of another item in that row. I’m using APEX 4.1. 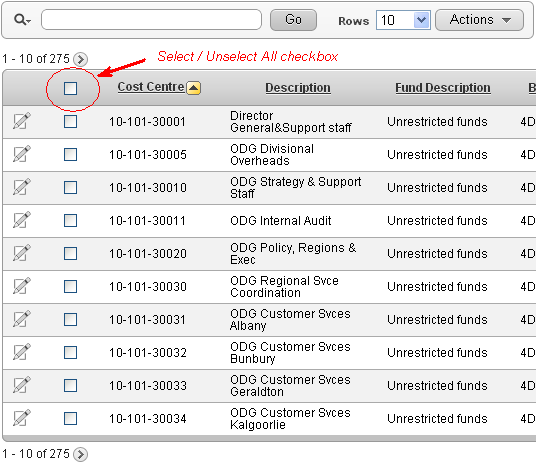 My tabular form has a number of editable fields representing budgets. Each line might be an Annual budget (AMOUNT_TYPE = ‘YEAR’) with a single amount for the year, or a Monthly budget (AMOUNT_TYPE = ‘MONTH’) with separate amounts for each of the twelve months. The first editable item (internal id f02) is AMOUNT_TYPE which is a Select List with an LOV. The second editable item (internal id f03) is the Annual Amount and should only be enabled if AMOUNT_TYPE = ‘YEAR’. The 3rd, 4th … 14th items (internal ids f04..f15) are the Monthly Amounts and should only be enabled if AMOUNT_TYPE = ‘MONTH’. 1. Define a visual style to be applied to items that are disabled. In this instance, I’ve set the background color to a light grey, the text color to darker grey, and I’ve added a strikethrough effect. The above code first determines the id for the row; $(this.triggeringElement).attr(‘id’) returns ‘f02_nnnn’ where nnnn is the row number left-padded with zeroes. For Oracle peeps, substr(4) is equivalent to SUBSTR(x,5). If the value of the triggering item is MONTH, we want to disable the Annual amount item and re-enable (in case they were previously disabled) the Month amount items. And vice-versa. To disable an item, we set the readOnly property (note the capital O: this is case sensitive!) to the value “readonly” (all lowercase); this makes it so that the user cannot modify the value in the field. Note that we don’t set the “disabled” property because that would stop the item being posted to the database, which will break the tabular form processing. Side Note: at first, I was using the .attr and .removeAttr jquery functions to set/unset readOnly as per some notes I’d found on the web; this worked for Chrome, but it made all the items permanently read-only in IE7; after some googling I found this is a feature, not a bug; and that .prop is the correct function to use in this instance. We also set the class to the CSS style we defined earlier. Next, I want to enhance this page further, so that when the user is entering monthly amounts, the Total field automatically calculates the sum of all the months (while still saving the original annual amount, if any, on the database). I had to get outside help [stackoverflow] to get this working.